The Tripoli Boys spoke to Amjata Bayoh and Mohamed S Camara. 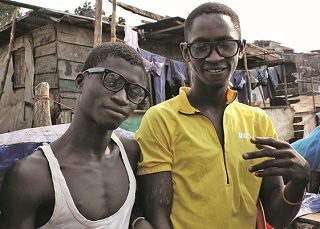 The Tripoli Boys live in Moa Wharf, a slum in Freetown, SierraLLeone. ‘Colonel Qadafi’ leads the group of 40 young men. Moa Wharf is one of Sierra Leone’s worst slums. 8,000 people live there in one square kilometre. Here was the first Ebola case in April 2015. It seemed like the end. 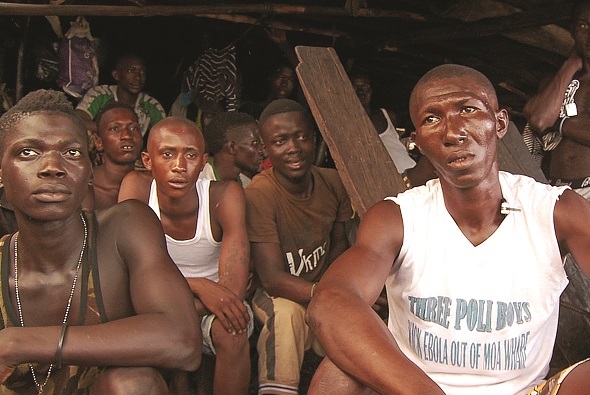 But the Tripoli Boys in Moa Wharf became leaders in the fight against Ebola. People thought the Tripoli Boys were always in trouble – drinking, taking drugs, fighting, and stealing. But when the Tripoli Boys joined the WHO and the Social Mobilization Action Consortium, people changed their minds about them. The Tripoli Boys come together for the interview in the headquarters, where baby pigs are sleeping on the dirty floor. They will sell the pigs to make some money. Qadafi says he gives shelter and opportunity to the Boys. They have to fill out an application form to join. My name is Five-0 (it means ‘people will die for you’). I got the name because I try to help people. I had a bad relationship with the leaders. But the Ebola training gave us the opportunity to work with community leaders. We learned how to win people’s trust, they taught us about the illness, how people could protect themselves. We told them it is OK and you can bring out your sick and that we will not kill them. They were worried about that. We made them feel better – ‘Do not be afraid, come and tell us how you are feeling. We will take you to the hospital and then see that you come back.’ That was what we did. Our leader Qadafi caught Ebola but he lived. While he was sick, someone burned his fishing boat and there were floods here. Seven of our boys died from Ebola. When we saw that our people were suffering, that gave us the courage to do this work, not for ourselves, but for everyone. When we helped, Ebola began to go away. I believe it is thanks to us that this place is not empty and that not everyone died. We are happy Ebola is finished. But we would like people to know about the work we did, so that people will say, ‘These are the boys who helped to fight against Ebola!’ We don’t want to live here with the pigs. We have nothing to do…! We want to work with other people. Then we can do more in the community, not only here, but for all the country. We want people to say, ‘These are the boys! These are the boys who fought Ebola!’ Then, if we wear our ‘Kick Ebola Out’ T-shirts on the street, people will know us. This page was last edited on 1 July 2016, at 18:17.